You can arm the alarm panel via phone, SMS, remote control or the arm button of alarm panel. If you frequently travel or want to make certain that your home is secure while you are away, this system is an ideal choose for you. The alarm panel will send SMS and auto dial to the preset phone number when any sensor(door sensor, PIR sensor...) is triggered, once dialed, the recipient can then listen in and even broadcast their voice over the control unit to scare away the intruder, and the siren will sound on the spot at the same time. All of these things will make it very hard for anyone to get into your home or business and help you keep enjoy all the comforts of your family. You can set the preset number to police station, and also record some voice(less than 10 seconds) into the system, then when alarm panel call the police station number, policeman will hear your voice which you have stored into the system. 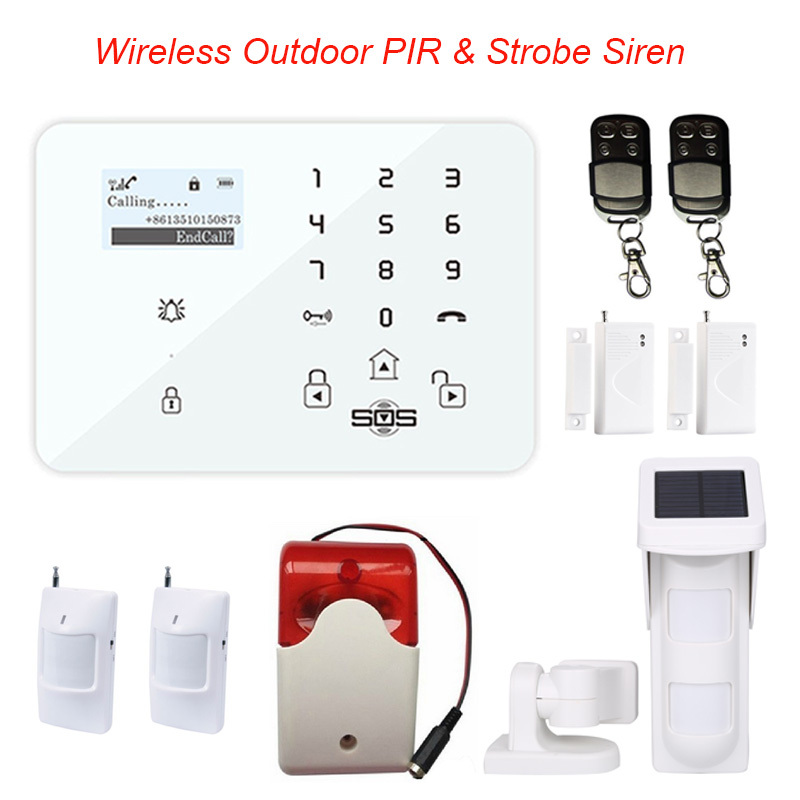 Optional wireless devices can be added to provide control over other functions including wireless smoke sensor, wireless gas leak sensor, Pet-immune(Pet friendly) PIR, wireless signal repeater, emergency key to meet your need of beefing up your Home security alarm system. 99 Wireless defense zones: Each defense zone can be coded one wireless sensor, so totally can be coded 99 wireless sensors. Four Bands: 850/900/1800/1900MHz, for worldwide usage. No need to plug into a phone line: Simply insert a SIM card into the Wireless GSM Control Host. Tamper alarm function:there is a button at the back side of the panel, it will make alarm once the button is loosen. Blue LCD screen with time clock and alarm status display. Voice prompt for all operations so that you can easy to set the alarm system. 3 Groups of timely Arm and Disarm: You can timely Arm and Disarm the system even you are not at home. Can store 6 phone numbers: when alarming, system will make alarm call to these numbers three times automatically. Dial on the keypad directly to make a phone call just like the cellphone. Remote control the alarm system Arming, Disarming, Monitoring and Intercom by your cellphone. 10-second automatic message recording: After you connnecting the GSM SIM card, you can record 10-second message. Remote location SMS Arm, Remote location Phone Arm. SOS, fire, gas, door, hall, window, balcony, and boundary places alarm. Real-time, delay, 24 hours, bypass defense zones programming function. Wireless coding: easy to add additional wireless accessories. SMS confirmed when you Arm/Disarm the alarm system through Text. Built-in Backup rechargeable battery: Still can last for 4 hours and Send SMS to remind you when power off. There is GSM signal bar on the LED screen: easy to check the GSM signal strength. The Main Host can connectmore than one wireless flash sirens A6 and one wired siren at the same time.